After the release of their self-titled debut, Seattle’s Fleet Foxes had quite the challenge ahead of them of releasing a worthy sophomore album. After years of writing, touring, and revision, Helplessness Blues is a piece of baroque pop bliss that is certainly worth the wait. 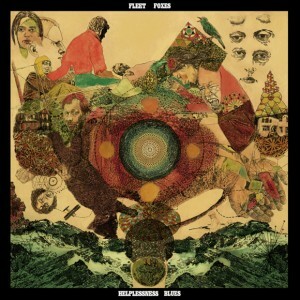 While Fleet Foxes felt like sound breaking through a blanket of snow, Helplessness Blues has more of a springtime climate, a bit warmer even if that heat seems to come from evenings spent gathered around a fire. One of the keys to the band’s beauty is the vocal delivery. Layered and lush, these takes are consistently good with little effort. There’s no need for electronics to interfere and autotune; these men simply have the sort of harmony that any choir would envy. Clocking in at nearly an hour, the record contains several triumphant moments. “Bedouin Dress” has Celtic-inspired strings that evoke the image of line dancing. “Helplessness Blues,” available for a free download on the band’s site, is an ironically effective, sprawling and beautiful glimpse at futility. “The Shrine / An Argument” could be separated into two songs, but together, it’s much more memorable, with dark lyrics contrasting the beautiful melody until horns squeal to a fragmented conclusion. As modern folk acts have hit the mainstream, Fleet Foxes stay on top of their game with good reason. Commanding and atmospheric, it’s impossible to imagine they could produce a single song unworthy of an audience.